Wakefield-based manufacturer, Group Rhodes, is celebrating the dedication of a number of its staff, after introducing a 10-year long service award. 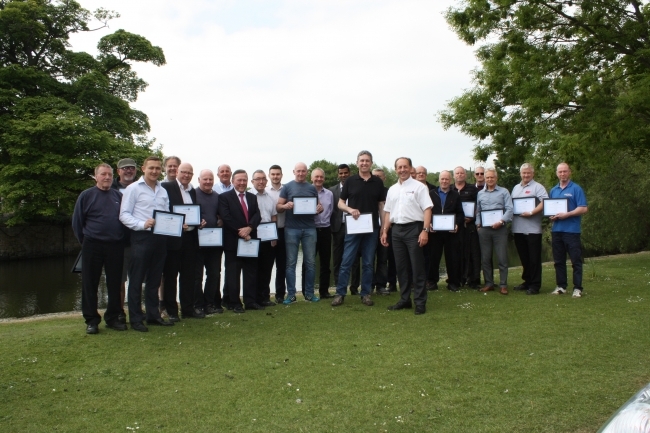 Twenty four employees were presented with a certificate and gift for achieving 10 years+ long service, with one employee, Gwyn Jones receiving a reward for achieving a staggering 50 years of service. Gwyn began as an Apprentice Machinist working at the company’s Belle Vue base in Wakefield. He is now a team leader and helps to mentor new apprentices. Group Rhodes is a global manufacturer of capital equipment, with a product range that includes hot and cold forming equipment for metals and composites and machinery used in the production of heavy ceramics. The company is also internationally recognised as a specialist in Superplastic Forming and Diffusion Bonding for both the aerospace and automotive industries and offers a full range of aftermarket services across a wide range of industrial sectors. Group Rhodes is made up of a number of businesses including Rhodes Interform, Hallamshire Engineering Services and Craven Fawcett.